Why is innovation elusive and hard? Organizations invest big money chasing ‘Breakthrough Innovations.’ According to 2012 Global Innovation Study by Booz & Co., global 1000 enterprises have spent a whopping $0.60 trillion in the pursuit of innovation just in 2011. It is a popular belief that innovation is about finding the next big thing and it is the privilege of an elite few. With less than 5% of any large organization getting approvals and funding to pursue breakthrough innovations while the remaining 95% focus on ‘Business As Usual’, innovation efforts may become a dartboard game of ‘Hit-or-Miss’. However, at Cognizant (NADAQ: CTSH), our problem was slightly different. Entrepreneurship was always ingrained into our DNA since its inception as a technology unit of Dun & Bradstreet in 1994. The testimony of our innovative spirit can be seen in the way Cognizant has successfully navigated the major industry transitions - from Y2K to e-business enabler, from e-business to full spectrum IT/ITeS consulting and Business Process Service provider. Recently, our early leadership in the currently emerging SMAC arena shows that our Innovation DNA is intact. Six years ago when we started the Cognizant Innovation Group, the challenge was channeling and preserving this DNA as our employee count swelled rapidly year over year due to the industry leading growth. Could Innovation be managed differently to enable this type of channeling while growing fast? How do we make sure everyone in the organization innovates when so many people are new to the Cognizant way of working? Is there a structured way to energize and enable everyone to innovate? Could employees innovate inside-the-box? Could that lead to the next big thing? Could the outcome of such Innovations be big enough? Would innovations from the ground-up make a difference? Even if the value of innovation impact is small, could the cumulative rewards be big? Could the concept of “Long Tail” be applied in Innovation too? This is an attempt at chronicling a journey that demonstrates the passion and perseverance of our associates over 6 long years and still going strong - the journey of Managed Innovation at Cognizant. “Managed Innovation” is a framework for sustainable cultural change, a set of processes, a collection of easy to apply innovation tools, a holistic measurement mechanism and an integrated innovation management infrastructure to enable every employee in the organization to participate in the innovation journey and harness the innovative spirit of employees. Managed Innovation is integrated into the service delivery model applicable for a large IT services organization like Cognizant. The premise is that such a framework would produce several measurable and small innovations and the cumulative impact would be bigger than its parts as in “long tail”. In the long run, a sustained Managed Innovation program will also improve the “creative confidence” of the organization. With over 6000 trained idea champions / innovation champions driving the innovation process across the organization, Cognizant’s Managed Innovation framework has evolved over the past six years, helping our customers and Cognizant to reap the benefits of a structured approach to innovation. In these years, Cognizant Innovation Group has gained valuable lessons and insights on the art and science of Managing Innovation at scale. In FY12 alone, Cognizant’s Managed Innovation framework has empowered 55,383 out of 150,000 employees to generate 134,242 ideas, implement 19,172 innovations for nearly 400 clients, amounting to a total value of about $548 million including both tangible and intangible savings based on our estimates. In 2007, Cognizant’s Board of Directors, after reading the future economic instabilities accurately, felt that the best way to help our customers and to retain the entrepreneurial DNA over a long period would be to invest in channeling the creative energy towards innovation efforts. A small team of leaders from diverse backgrounds across the company was assembled. This core team christened as the “Cognizant Innovation Group” was charged with articulating a right innovation model to help Cognizant sustain its entrepreneurship DNA and help its customers grow using innovation as a lever. Entrepreneurship was always ingrained into our DNA and Cognizant had designated teams for focused innovation. There were multiple “Centers of Excellence” and “Solution Groups” embedded within every business unit. We started engaging with these internal innovation hubs and other such specialized groups whose mandate was to innovate. However much we tried, we struggled to come up with a systematic method. In parallel, we also closely engaged with over 30 client-based projects. Given our service-centric business model and customer centric approach, our leaders and employees were dedicated to building deep, sustainable and long-term client relationships based on collaboration, customization and quality of delivery. They always met and often exceeded customer’s expectations and the clients were very happy with the efficiency and the value of the delivery. As we interacted more with the business unit leaders, project directors and managers, another insight emerged. Every one of them was supportive of innovation and they wanted to help their teams innovate. But they had other burning issues such as client interactions, maintaining SLAs, project pressures and other things like revenue and profitability to focus on. With reference to our customers, every client executive was aware of Cognizant’s industry-leading growth and our superior domain capabilities. They were appreciative of Cognizant’s capabilities to exceed their expectations. Clients had the complete knowledge of what was being delivered to them through the defined SLAs and extensive dashboards. In summary, we had customer centricity as a core value, we were meeting and beating SLAs and leaders were supportive of innovation. It looked as though everything was fine. At the same time, something else resonated consistently in some client CxO visits and in their conversations. This was very palpable with the clients who have had long term engagements with Cognizant. Few of the clients’ CxOs felt something was missing and some of them even hinted out the missing piece. It was also observed that certain accounts were not affected by these and we felt that those accounts must have been doing something different. It didn’t take a long time for the innovation group to realize some of the best run accounts figured out that the best way to deliver innovation in a service based business model was to enable employees innovate from the insights they gained. The needed attribute was not only the ability to execute what was told within the defined SLAs, but also to ask questions, challenge the assumptions and the ability to propose new ideas based on the insights gained from working on clients’ systems and processes. All these had to be done without taking the eye off current priorities and SLAs. The need was to put in place a transparent mechanism to enable, monitor, measure and report anything beyond SLAs. This mechanism had to be institutionalized across all the accounts. Back in 2008, with 100s of clients and over 60000 employees and with ambitious growth, the leadership team was struggling to arrive at a suitable approach. There were more questions than answers lingering in the minds of the Cognizant Innovation Group leadership team, which had little experience in managing innovation of this scale. What might be the cost to the organization? – Ask for big budgets given that everyone is spending big dollars or experiment using a small team with a small budget? The rest of the story discusses and elaborates how the Cognizant Innovation Group addressed these questions, challenges faced, results captured, insights gained and the lessons learnt from our journey. Not having managed innovation efforts of this scale was a blessing in disguise for the innovation team. It allowed us to look at every challenge with lively curiously and an open mind. It made us receptive to new ideas and to try them without any fear. One of the very first artifacts that we referred to was NASSCOM-BCG Innovation Report 2007 "Unleashing the Innovative Power of Indian IT-ITES Industry", which outlined the importance of innovation, need for innovation, state of innovation, gaps and recommendations. Given the client-centric culture of Cognizant, we closely engaged with client accounts on innovation. We believed that engaging with client directors, delivery directors and delivery managers of top 30 accounts would help us in identifying the needs and more insights on innovation. We felt employees need a common vocabulary on innovation. We described the term innovation as "people creating value by implementing new ideas” and added the concepts of ideators, connectors and executors. We went about explaining the meaning of innovation, the need for innovation, innovation process and innovation funnel, etc., through multiple one-on-one meetings and roadshows across locations. However, this further complicated the situation as everyone started questioning the very definition of innovation we had come up with. We kept refining and redefining the definition. It took some time for us to realize that everyone had their own definition of innovation depending on their role, the level and the exposure they had on innovation. Please read the lessons learnt section “Power of Perspectives” and “Power of Hierarchies” for more insights on how we addressed this. In the meantime, we also started a few experiments such as engaging customer accounts on innovation, training innovation champions on innovation tools and techniques, deploying an “Always On” idea management system, setting up the “Concept Lab”, a sandbox and fail-safe environment for rapid experimentation, researching on innovation tools and techniques, managing and on democratizing innovation. We engaged many industry experts on innovation, discussed various innovation models and participated in external innovation forums to gain more perspectives. The team attended many training sessions conducted by external innovation experts. We also organized innovation workshops for our internal innovation champions. Those external experts were really good and every example they took or taught was from product based innovations and business model innovations. In the meantime, we evaluated many Idea Management Systems (IMS) and finalized a specific IMS product that could be hosted in-house in our data center. We made few customizations and our own “Idea Management System” was ready. The Concept Lab, a “sandbox environment” for experimentation was also getting ready. Their motto was “Don’t reinvent the wheel, but pick few interesting concepts and build on them to make potential impact for our customers’ business.” To reduce the risk of failure and to mitigate mental blocks that might arise from ‘experienced hands’, they engaged student interns right out of colleges. They were building capabilities and concepts around Text Mining, Faceted Browsing and Robotics, to name a few. Circa 2008: The global economy was undergoing a huge turmoil. Amidst the worldwide financial collapse, some of our biggest customers in the Banking and Financial Services domain were the hardest hit. The fallout was felt everywhere; the entire business ecosystem and its supply chain were having difficulty in sustaining their core. Ordinary consumers were tightening their purse strings leading to butterfly effects in the automobile, retail, healthcare and insurance industries. Some clients were downsizing their commitments and some called for contract / price re-negotiations. Funding was hard to come by and we were exploring optimal way of creating a sustainable innovation culture and a thriving innovation ecosystem. We were realizing the importance of taking a contrarian approach to firing up the creativity in each and every one of the individuals and use the power of informal networks. That is when we came across two interesting HBR articles that set our spirits high and put us on the right path. One was “Teaming Up to Crack Innovation and Enterprise Integration” which, recommended setting up a “Distributed Innovation Group” which seemed to unravel the mystery we were seeking. The other was the story of “Paul Revere” from HBR Article on “How to build your Network?” and decided to create a network of connected people as information brokers around innovation for the cause of “Making everyone believe that they are creative and innovative”. As we began to focus on spreading innovation message and creating awareness amongst employees, our headcount swelled to 60,000. This brought more challenges than before. How will spread the innovation message o 60,000 employees across the globe? How many trainers will be needed? How many training classes will be required? We created a simple script for evangelizing innovation under “Innovation Igniters”. The core message was “Everyone is creative in their own way and every one of us is a potential innovator”. The team followed the Train-The-Trainer model to create Innovation Igniters and make them ignite the spirit of innovation across the organization. It was like a stand-up comedy; there were no PowerPoint presentations; no projectors; no classrooms and no expertise on innovation required. Anyone could become an innovation Igniter. All they had to do was to walk into a work area, draw people’s attention and enact the script. The outcomes were very encouraging and by the end of 2009, the Innovation Group had seeded over 2500 Innovation Igniters across all of Cognizant’s India locations and each one of these igniters was spreading the message of innovation. Together, we reached out to thousands of employees through these floor-talks and generated insightful information on the enablers and blockers of innovation. Today, this is an ongoing program and each year the Innovation Igniter script is improved with more information and different activities. In the year 2012 alone, a total of 379 igniter sessions were conducted across the organization covering over 10,000 associates. One inspired Innovation Igniter from our BFS practice had single handedly conducted over 100 such sessions covering over 3500 individuals. Reports were collected on a periodic basis and experiences were shared using internal blogs. We started seeing patterns and valuable insights emerged. These insights helped us to tweak our innovation approach and define rewards and recognition programs. These igniter sessions inspired everyone. It was a 60-90 minute fun-filled, informative and inspiring session for the audience. The next challenge was how might we inspire everyone to do something about innovation? Inspired by stories and examples from industry leaders like Toyota, 3M and Intuit, we were certain that the key to building creative confidence of our associates had to be through Kaizen or Continuous Improvement. We wanted to encourage them to “Minnovate” rather than going after risky and hard-to-get breakthrough innovations. The missing piece was “innovating in a services-based business model”, where everything revolves around meeting and beating well defined SLAs and delighting customers by exceeding their demands. The BIG vision of enabling everyone to innovate in an IT services- based project delivery model was still a distant dream. We decided to try a different approach by equipping employees with the right set of tools suited for our services business instead of complex, hard to grasp innovation frameworks. This led to the development of the Innovation Capability Building Program - ICBP. These capability programs were designed as 2-day intensive, activity-based workshops covering various aspects of the Managed Innovation process. Those who attended these sessions were called as “Idea Champions / Innovation Champions” and they were provided with continuous mentoring by the Innovation Group and peer-coaching by other champions. Along with their primary role, they also had additional responsibility to be innovators, facilitators of innovation, evangelize innovation, identify problems, facilitate ideation sessions, enable others to innovate and manage innovation within their accounts. Soon another challenge arose. Given the lack of any industry standard training, certification and any defined career path for Managing Innovation, how can we make sure these trained innovation / idea champions are continuously engaged? The innovation Group devised a certification program to recognize these champions who have been fostering the culture of innovation and successfully managing innovation within their customer accounts as Cognizant Certified Idea Champions and Cognizant Certified Innovation Champions. A set of simple guidelines, transparent metrics, nomination from their respective managers and a final review by the innovation group were the qualifying criteria to get certified. We have been certifying qualified individuals for the past five years. Over the years, we have also instituted awards and rewards like “Best Idea Champion of the Year” and “Best Innovation Champion of the Year” and they have become coveted awards within the innovation community and the organization. Over the past five years we have trained over 6000 idea champions. Of these trained idea champions, over 1500 champions were conferred as Certified Idea Champions and about 400 as certified innovation champions. We had regular calls and meetings with these innovation / idea champions to gain further insights. One such meeting threw light on a very interesting concept that became the best innovation management tool we ever adopted. The innovation champion handling one of our large consumer goods customers shared his story on how he had instituted a bottom-up innovation culture in his project long before the innovation group was formed and how he used a simple dashboard to keep track of all the innovation work done within all the projects at the Consumer Goods practice level. Inspired by this concept and Global Innovation Index, we researched on measurement for innovation and developed Cognizant Innovation Index. This index is essentially a balanced scorecard to keep track of all the elements of Managed Innovation within every group in the organization. For example, aggregation of all Project Innovation Indices becomes the Account Innovation Index and further aggregation of them makes it the BU Innovation Index and further aggregation leads to the Cognizant Innovation Index. Each month, the index is computed and circulated to the innovation community across the organization. In the year 2008, the Innovation Index was mostly piloted within Consumer Goods practice accounts. In the year 2009 it was broad-based and increased to 50 accounts in the Retail, Hospitality, Manufacturing and Logistics and Consumer Goods business units and 25 accounts spread across few other BUs. Starting 2010, it was measured across all business units including Cognizant’s corporate functions and the results were encouraging. The next challenge was how to use the Innovation Index as a lever to produce behavioral change and improve our innovativeness? Innovation is not just one-off activity but a continuous behavioral change that needs constant triggers. Every year, based on the insights, index parameters and the percentage weightage are also tweaked to achieve the desired behavior. The Innovation Index is also reset to Zero, at the beginning of each year, forcing every team to rethink about their innovation strategy from the ground-up. For example, in 2008 and 2009, the focus was on idea generation, idea proposal and idea execution. The very first version of index in 2009 had 25 different parameters to measure. But, the current index in 2012 has just 10 parameters. From year 2010 onwards, $ impact was added as one of the key measures. From the year 2010, weightage for innovation outcome in $ terms was considerably increased. Circa 2010: As our idea champions and innovations champions were out in the field, they were generating interesting and useful insights. One of them is around Innovation Contexts. Cognizant had one of the best integrated Delivery Management and Collaboration Systems called as Cognizant 2.0. It enabled us to globalize and virtualize delivery to ensure timely and high-quality services are delivered consistently to our customers. Most of the client specific tasks, delivery process, and knowledge management including SLA tracking were already part of it. Our innovation process begins with a problem or an innovation challenge. These challenges are launched as innovation campaigns in the idea management system and employees are encouraged to contribute ideas. Most of the innovation challenges have come from client related contexts. At the same time, clients have started to demand innovation as a part of service delivery. The issue was that delivery management and innovation management systems were two separate, disconnected entities. The Innovation Group had heavily invested into a third-party standalone idea management system that was not integrated into our delivery excellence platform. The next challenge was how to enable delivering innovation as part of our delivery excellence commitments? After a lot of internal deliberations, it was decided that innovation management system would be integrated into the delivery management platform Cognizant 2.0 building on its core abilities and especially leveraging the enterprise collaboration and social media capabilities. It would support the end-to-end innovation process from innovation campaigns, idea generation, idea rating, ranking, idea selection, idea proposal and all the way up to idea implementation and impact tracking. Today, integrated innovation management system is a core part of delivery system. Here is a representation of how this platform helped a project team to innovate for their healthcare client. They took a problem, generated 63 ideas, picked 4 best ideas, merged them into a proposal, got it approved, built a proof of concept, implemented and evangelized. The story below is an example of how once we created a thriving innovation ecosystem we didn’t have to worry for new ideas even for complex management topic as “Innovating Innovation”. What is in it for me? - WIIFM is a powerful acronym that everyone in the change management business should know to tackle. This insight came from a set of idea champions during the Cognizant Innovation Summit 2010. They mooted an idea of Innovation Bank or iBank. iBank is focused on encouraging employees to get credit for their individual contribution towards implemented innovations. The value of the innovations in dollars could be deposited as virtual money into the innovator’s virtual bank account. iBank provided the capability for any innovator to track the innovation impact created by him or her. It also builds peer pressure amongst employees creating a positive change management towards innovation and encourages reporting of innovations however small they might be. We also created annual awards for the top 3 employees with highest iBank credit. Innovations Galore: As we engaged the wider organization on the subject of innovation, we saw that passionate people were already innovating even without an organization mandate or structure or rewards or recognitions. These were mostly need-based such as outcomes of daily frustrations, unreasonable client demands and market dynamics such as competitive pressures. The challenge we faced was how can we unearth these innovations from across the organization and spotlight them? The National Association of Software and Services Companies (NASSCOM) the premier organization which sets the tone for public policy for Indian software industry conducts annual event to identify top innovations. Starting 2009, we took this as an opportunity to execute a companywide innovation awards competition as a precursor to NASSCOM innovation awards. A structured process was instituted for collecting nominations from across the company under three categories — Business, Process and Technology. These nominations are then put through multiple rounds of internal reviews and the top five in each category are chosen.. These Top-5 candidates have to present their innovations in front of a grand jury comprising of executives at the Senior Vice President level and eminent external judges drawn from the academia. This process paved way for Cognizant Innovation Awards, a set of prestigious organization level awards. What started as an Innovation Awards in 2009 with over 250 nominations has grown to encompasses many more categories and certifications with close to 2000 nominations and cash awards totaling to more than USD 25000 in 2012. The next challenge was how can we evangelize best innovations for adoption in a globalized organization? While it is a great feeling to go through tough competition and win awards, the innovators get real recognition for their hard work only when their innovations are adopted and the benefits are reaped. In addition, adoption enables a vicious feedback cycle that triggers the next wave of incremental or breakthrough ideas. This lead to another initiative called Cognizant Innovation Journal. In the year 2008, we published innovations from the Concept Lab. From 2009 onwards, we started publishing top innovations from various business units. Every year, this journal goes through metamorphosis with the changing times. What started as a research publication as a hard bound volume in 2008, turned into a compendium of innovation stories in a story telling format published in the Apple iBook format in 2012. Today, our Innovation Journal is more about best innovation stories from Cognizant and how we innovate and made available to everyone in the organization and our customers. The next challenge was, given the distributed, multi-locational, global nature of the organization, how can we excite, engage, educate and enable networking of people to trigger innovative ideas? Innovations happen at information crossroads. They happen when people, thoughts, ideas and solutions collide and converge. This is possible only when people get a chance to connect with others to share their ideas, their innovations, pains and frustrations faced by customers and learn from each other. What started as an experiment at our Retail business unit in November 2008 is today an annual affair across all locations across the globe. Retail practice held the first innovation fair for five consecutive days showcasing 23 innovations touching close to 2000 employees within the practice. We christened it as Innovation Fairs - a platform for crosspollination. As in any traditional fairs, there is something for everybody. Innovation Fairs aim to highlight the importance of innovation, make the employees experience various traits, mindsets, tools and techniques of Innovation and enable people to practice innovation by way of participation in multitude of creative activities. These fairs are owned and executed by the local Innovation Community with the support of executive leaders in each of our company’s locations across the globe. Circa January 2010: This was a defining year. Many of our initiatives started yielding results. The first and the most important was the Concept Lab. Concept Lab was setup with the mantra of “Leverage mature research concepts to innovatively solve business problems”. To identify business problems, we employ several methods which include viewing the pains of the business from various frames of references, ethnographical studies, outside-in, inside-out, to name a few. They undertook repeated rounds of discussions with users, developers, leaders and seek customers’ views on the problems. Once the problem was clearly defined and understood, they employed student interns, who are required to acquire industrial experience during their studies, to search for suitable research concepts. These students became integral part of identifying and testing the fitment of research concepts and our innovation journey. While students acquired their expertise in niche research areas and understood the concept of problem solving in the business context, the repertoire of tested and validated concepts grew for Concept Lab. This unique approach of keeping the business problem at the center of the equation rather than technology or research, gave enough freedom to analyze problems from various frames of references – customers, Cognizant, users and developers; to co-create with academia and leverage their vast experience in R&D in various areas rather than duplicating them internally at a huge cost; to develop a sandbox environment for rapid prototype creation and foray into various disciplines of research which includes text mining, robotics, semantic web, financial information processing, big data and text analytics, autonomous computing, augmented reality, and hardware design. Many of the innovations from this lab have gone live for internal and customer usage. For example, a recent innovative solution arrested several thousand pounds of revenue leakage for a manufacturing customer during its first three months of operation alone and it continues to save more for the customer. The second was the strategy to include Cognizant’s own internal corporate functions into the managed innovation ambit. With the innovation initiatives delivering impact to clients, and Cognizant growing fast, it was just a matter of time to apply managed innovation methodologies to support scaling Cognizant’s corporate functions to attain organization’s long term ambitions. All of Cognizant’s corporate functions became part of this and Managed Innovation has delivered tremendous impact for Cognizant. By end of year 2012, these functions together have generated over 15000 ideas, implemented close to 1000 innovations resulting in $ 150 million innovation impact. The third was even more interesting. Any reward or recognition is not special if given in private. Awards become special neither by the size of the cash award nor by the physical size of the memento. What makes the award special is the forum in which it is given, the person bestowing the award and the audience at the award ceremony. This insight came from the very first innovation awards in December 2009. Cognizant organizes the Senior Managers’ Meet periodically. In these business meetings, Cognizant’s CxO level leaders give business updates and interact with the managers in the true Cognizant spirit of openness and transparency. When we chose to give the first innovation awards during this meeting, the awards were given as part of other recognitions and the award recipients expressed a need for an exclusive platform that would make the innovation awards even more special. This mooted the idea of organizing an annual innovators’ meet which eventually became Cognizant Innovation Summit. Cognizant Innovation Summit is an annual forum for innovators from across Cognizant to congregate, learn from each other, share ideas, insights and trends, and network with fellow innovators. Innovation Summits are one of Cognziant’s largest internal events by importance, the executive patronage, audience participation and by the sheer size. Each year, the Innovation Summit is organized around a theme. Innovation Summit is a by-invite only program for the innovation community hosted by Cognizant Innovation Group. The attendees are Innovators who have innovated, created solutions and won awards, Innovation Igniters who ignited everyone’s mind on creativity and innovation, Idea Champions who facilitated idea generation, measured impact etc., Innovation Champions who manage the innovation process, Innovation leaders who demand and fund innovation. It is also a platform for recognizing and rewarding our best innovations, innovators and catalysts for their work on innovation across the company. Circa June 2012: Next New Challenges for Managed Innovation: The innovation journey is a continuum and it never stops. With the progress made over the years, today, every BU leader is proud of their team’s achievements; especially the volume and the impact of bottom-up innovations. Leaders are seeing the creative confidence of the teams improve manifold. Now, business leaders are challenging the innovation community to come up with bigger innovations. As we plan for the next phase of innovation journey, the question that is lingering in our mind is how we can find a way to identify ‘Seemingly Impossible Problems’ and how we can help execute “high risk / highly uncertain innovation projects” in a large scale across the organization. The journey wasn’t an easy one. It was fraught with challenges. Here are some of the challenges faced by us. In our experience, there are multiple perspectives to innovation outcomes, each coming from the priorities of executive stakeholders who run the business. For example, in an organization, CEO, COO and CFO could have their own perspectives and innovation efforts have to heed to these needs. We see such perspectives with leaders across our organization. Many BU leaders and profit-center heads sometimes wear all the above three hats at the same time. For example, in our IT services business, innovation priorities of different stakeholders. The big management challenge was, how can we create innovation programs that meet each of these stakeholder perspectives and needs? Our Tactic: At a fundamental level, Managed Innovation is focused on improving the “creative confidence” of target group in stages over a period of time in a structured way. We have also seen the cumulative impact of such innovations. The best way to handle such situations is to take the BU in question and plot their innovation portfolio. Based on the gaps, we provide remedial recommendations. As an organization scales to an enterprise, hierarchies are built to provide management direction for seamless execution and to reduce risks with each layer having certain skills and priorities. However, this introduces a challenge for managing innovation as each layer in the hierarchy is designed to focus on tactical, operational and strategic aspects of running a business. The specific management challenge was how can we create innovation programs that meet needs of these hierarchies? Our Tactic: While innovation does not follow hierarchies and anyone could come up with ideas, managing innovation certainly needs different skills at different levels. We have designed our Managed Innovation program to address these needs at different levels. We also came up with specific titles and specific responsibilities for each of these layers and instituted organization level training, measurements, rewards and recognition. The common belief is that creativity can never be demanded and innovation can never be measured. However, large enterprises are very good at it, setting benchmarks and taking directions based on such measurements. Measurements play a vital role in an enterprise, starting from client SLAs, revenue targets and all the way up to performance appraisals. If there is no progress and the value is not demonstrated, programs are shelved. Innovation programs are no exception to these management practices. The management challenge was how can we design Innovation Programs that demonstrate a sense of progress and deliver tangible impact to sustain in the long run? Our Tactic: We would like to explain this through a well-researched article Global IT Culture Survey - Forrester Research, August 2008 which plotted various activities in changing the culture in effectiveness against effort plot. Armed with the insights from the above, we implemented five specific tactics. Statement of Leaders: This was the easiest. Every one of our leaders always supported innovation. They shared their views and stories on innovation. Encouraging Behaviors: This was achieved by defining carefully designed Rewards and Recognition programs. We had rewards and recognitions for best rated ideas, best approved ideas, best implemented ideas, ideas appreciated by clients, highest innovation progress based on innovation index and value of innovation impact. Innovation Awards at individual and BU levels were also given. Demonstrating Benefits: This was hard. The first barrier was to change the mindset towards what was innovation and what was not. Employees thought that everything they did was part of their job and they weren’t innovating. The second barrier was arriving at an impact. Every innovation is unique and there is no simple, right way to calculate the impact. Some innovations provided tangible and many innovations delivered intangible benefits. We came up with a simple method to calculate the innovation impact. When people started seeing the benefits of their innovations, they were convinced. Actions of Peers: The Cognizant Innovation Index was the biggest enabler of this behavior. Enterprises thrive in right amount of pressure and competition. Once the innovation index was published to the innovation community, everyone started comparing theirs with others. They started taking note of what others are doing differently and set a stage for healthy competition. Actions of Leaders: With an ingrained entrepreneurial culture at Cognizant, this was an easy one. Leaders spoke about innovation in town halls, participated and spoke in innovation fairs and summits, gave away innovation awards, allocated funds for innovation execution and allocated certain resources as Innovation Champions and Idea Champions to measure and monitor the progress of innovation efforts. Where and how do we focus - “Tomorrow's feast Vs Today's bread”? Should we focus on common problems that everyone sees or uncommon problems that very few see? Should we implement on common ideas that agreeable to everyone or uncommon ideas that are whacky and new? Finally, being part of the Innovation Group, how do we justify and provide a career path for an innovation catalyst role that does not innovate, but creates and nurtures an innovation culture? These are interesting challenges and we don’t have direct and concrete answers. These are very context-specific to a company, its leadership, its culture, its business model, its products, its services, its customers, the geography in which they operate and the situation on hand. Finally, the most important aspect is where in the “S-Curve” the organization is positioned at the time of taking decisions. Innovation is an intuitively simple process, yet surprisingly elusive. Our business is made up of heterogeneous customers from various domains demanding solutions using different technologies. Customer specific ideas and innovations have to come from the insights working on client’s processes and systems. Hence, it is simple to say distributed innovation is the way to go. However, when you have 150,000 employees spread across 100s of client projects distributed in many delivery centers and client locations across the globe, enabling and empowering them makes “innovating innovation” even more complex and hard. Here is a set of metrics that show the progress and accomplishments over the last 5 years timeline. As described in the beginning of the story, we had many questions. Throughout the past 5 years, we have had multiple challenges, tried multiple experiments and learnt valuable lessons. Managed Innovation has not only delivered impact but also created a large innovation community within Cognizant. If creating such a huge community is hard and metrics are a leading indicator, then keeping this community alive is even harder. We are proud of our achievements and this article is our way of contributing to a broader innovation community by sharing our experiences. While the lessons and insights are already part of the story, we would like to share few important lessons for those wanting to learn from our journey. Do not discount the small and tiny: In the history of innovations, many of the innovations and breakthrough opportunities started as small innovations. Some were successful at the first attempt, and some did not succeed and many came back after a period of hiatus to become breakthrough. If you are in the services business, there is no specific time allocated for innovation. Innovations in a services business have to happen on-the-job and they have to come from the insights gained from doing the job. Finally, as we have seen, there is merit in the ‘Long Tail’; innovations however small, when aggregated, create a big impact. In the year 2012 alone over 19000 innovations have created an overall impact of 548 million dollars while the average impact of an idea is just $ 2800. An example from one of our accounts in the Life Sciences business unit is shown in the plot below. They have implemented 100s of ideas and many ideas in this list are tiny and small. Only few were in the breakthrough area. However, the cumulative impact of those tiny innovations was $ 1.3 million out of total $ 1.8 million. It’s about signal and not noise: Innovation is not about always creating something new all the time. It’s about creating impact. In our observation, everyone has ideas and there are plenty of ideas out there. It is very easy to come up with a brilliant idea. It is difficult to come up with a working prototype. It is hard to get funding for implementation. It is even harder to make your customers adopt innovations. While running organization wide innovation programs, it is important to measure the impact using appropriate parameters and use those measurements as a base to tweak the program. Managing innovation is a long haul: Machines don’t produce ideas; it is the employees with the right insights that ideate. Every breakthrough innovation in the world came from the frustration innovators had and in most of the cases they were experts in their field. Investing in an employee-centric innovation culture and empowering everyone takes time. Lessons cannot be learnt in a single day and every single tweak takes time to rollout. With the millennial workforce, mandates don’t work. It has to be voluntary. Innovations don’t happen in isolation, but in collaboration. Be prepared —sustaining continuous innovation is hard and needs management support for a long time. Finally, a parental attitude towards managing innovation is required. At the end of the day, it will be the innovators who would be in the limelight; not the people who created the innovation culture. You need a mature team that understands this fine point. In our case, our management funded and BU leaders supported the managed innovation efforts and the core team of innovation group persevered together for six years. Long before, it was considered that Management is an art and leaders are born. Today, we have management schools teaching the science of managing and producing future leaders. Long before, it was believed success is an outcome of sheer luck. But Malcolm Gladwell in his book Outliers argues success in any field can be achieved by practicing the skill repeatedly for at least 10000 hours. Based on our experience managing innovation in large organizations like Cognizant, we believe everyone is creative, creativity can be taught, Innovation can be practiced, Innovation can be managed and Managed innovation is NOT an oxymoron. Executing an organization-level innovation program of this scale and sustaining it for the past six years needs a lot of perseverance and patience with scaffolding from many people at different levels within and outside the organization. Many leaders and individuals played a key role in shaping the Managed Innovation Program over this period. While we thank everyone, here are a few who played pivotal role in defining Cognizant’s Managed Innovation. Innovation is the journey towards the future which is unpredictable and unknown. Without management support, innovation programs cannot sustain for a long period. The first set of credits are dedicated to our CxOs Francisco D'souza, CEO of Cognizant for his executive sponsorship, Gordon Coburn, President who was then CFO for his meticulous reviews and budget approvals, Chandra Sekaran, Group Chief Executive for his continuous mentoring. Whether there is a structure for innovation or innovation is demanded, there would be someone making a difference somewhere. All we need is to seek and find them. Vishal Anand, Client Partner, then the delivery manager and innovation champion for the Consumer Goods practice deserves a mention for pioneering the first bottom-up Innovation at Cognizant. There are leaders who take the lead and travel to extreme ends even before others can think. Credit to the Consumer Goods Practice and Prakash Hemdev, VP for conceiving the first innovation dashboard and including innovation in the management scorecard. Scaling anything requires tremendous belief in something and an equal amount of willpower to see it through. Mahesh Venkateswaran, SVP, for piloting the Cognizant Innovation Index across 50 accounts within the RHMLCG business unit deserves a very special mention. There are leaders who think beyond the horizons. Debashis Chatterjee, SVP, needs a special mention for his vision in setting up the first Innovation Group within a large business unit. Measuring the most important aspect is the key to driving behavior. Credits to Nagaraja Srivatsan, SVP – Emerging Business Accelerator and Sairamkumar Jayaraman, VP - Life Sciences BU and their team for figuring out a way to calculate $ value for every innovation and influencing the introduction of the $ impact in the Cognizant Innovation Index. Thanks to Vinayambika Kidiyur, SVP – Healthcare Business Unit and Ravikkumar Nalliyappa, Biz. Account Manager for pioneering partnership with clients on Managed Innovation leading to transforming client relationship. Innovation must never be the forte of few. It should be as distributed as possible. Credit goes to Sumithra Gomatam, SVP - Testing BU and her team and A. Prem, Senior Architect - CRM practice and his team and for developing their practice specific Idea Management Systems. For an organization with 150,000 employees spread across the world, scaling managed innovation model integrated into the delivery excellence platform requires a solid infrastructure. Credit to Rajashree Natarajan, Vice President, Process and Tools Group and her team at the Process and Tools Group and for developing the integrated Innovation Management System. Hackathons are great platforms for enabling employees to solve pertinent problems with a right solution at the shortest time with the lowest investment. Special credit to Cognizant Application Services, the internal IT team for creating Hackathon as a culture, Muthu Kumaran, VP - Insurance Practice for hosting the first BU level hackathon and the Manufacturing and Logistics BU for hosting the first client-facing Hackathon. Innovation is not about finding something new. It’s about applying something that works well somewhere within one’s context. Credits to industry leaders like Toyota, 3M and Intuit for helping us understand the innovation culture aspects that forms the foundation for Managed Innovation. There’s got to be someone who would experiment with ideas, apply, test them and come back with valuable insights. Credit to Vijay Rajagopalan, Director at Technology BU and Tamvada Veenadhari, Senior Manager at Manlog BU for their tireless efforts in trying out every aspect of Managed Innovation and providing valuable inputs for the past five years. All these efforts make a difference only if they lead the organization to move into a different maturity model recognized by the industry. Thanks to Hariharan Mathrubutham, VP of Delivery Assurance Group and his team for their constant guidance and making Managed Innovation as part of SEI CMM Level-5 certification criteria. Credits to all the Igniters, Idea Champions, Innovation Champions and Innovation Leaders from across all the practices who have been part of managed innovation journey. Finally, a capable team with diverse skills that leverages each other’s strength and open to new ideas is a must to spearhead innovation efforts of this scale. Credit to each and every member of Innovation Group led by its leaders Sukumar Rajagopal, CIO and Head of Innovation, Ramaseshan Ramachandran, Senior Director, Kumar Sachidanandam, Senior Director, Bhaskar Venkatasubramanian, Director Neehivanan Elilananban, Director and Kumudha G, Assoc. Director for being together over the past six years for this cause of “Managed Innovation”. Thanks to NASSCOM and the Boston Consulting Group for their report NASSCOM-BCG Report "Unleashing the Innovative Power of Indian IT-ITES Industry" released in 2007. This report laid foundation to our understanding of managing innovation at a macro level. 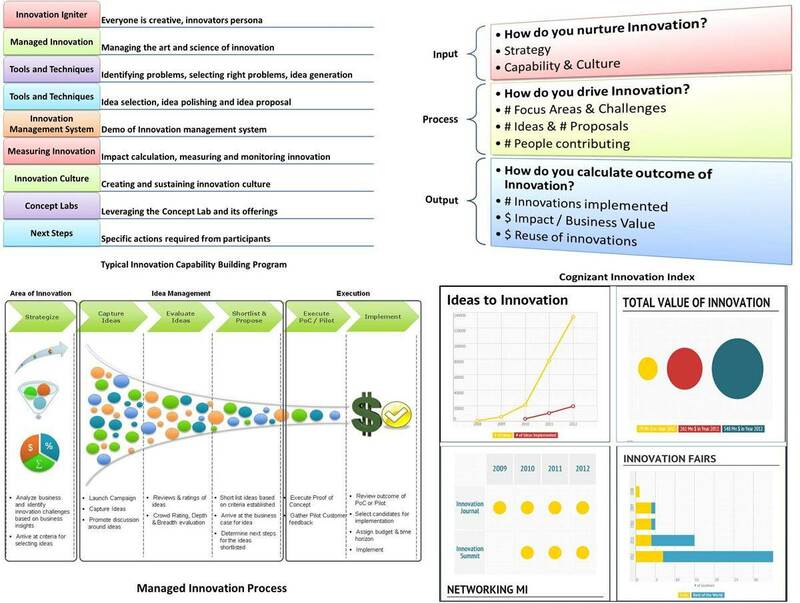 This report also introduced few important tools like the nine-cell innovation matrix for mapping innovation profile, elucidated the pathways to innovation using the concepts of motivation and discipline and the three simple-step process to optimal innovation journey. Thanks to Fredrik Härén, (http://www.theideabook.org/fredrik_01.html) Creativity and innovation expert, inspirational speaker and author of “The Idea Book”, an international bestselling management book on business creativity for inspiring 600 idea champions by his workshop on innovation and teaching the concept of “ideamation”, which is one of the best tools we have ever learnt in our innovation journey. Thanks to Vinnie Mirchandani, founder of Deal Architect(http://www.dealarchitect.typepad.com) , a former technology industry analyst (with Gartner), outsourcing executive (with PwC, now part of IBM) and author of two wonderful books “The Technology Elite” and “The New Polymath” for his constant support by being part of our innovation journey and inspiring our North America innovation community. Thanks to Jatin Desai, CEO, Co-Founder of “The DeSai Group” for his constant support in enlightening the Innovation Group members on the tools and frameworks for innovation in addition to being a well-wisher of our Managed Innovation efforts. Thanks to Parvathi Menon and Devika Devaiah from Erehwon Consulting (www.erehwonconsulting.com) for their innovation workshops and coaching our innovation champions during the early stages of our Managed Innovation journey. What a great story! Thank you for sharing. I will try to see if we can take some of your best practices and implement them within Rabobank. Congratulations to Cognizant team for winning this Innovation Challenge. Definitely Managed Innovation (MI) is not an oxymoron. The story of MI in Cognizant is more than enough proof for this. Kudos to MI Leadership and MI team at Cognizant. Kumar - Thanks for the brilliant walk through of our journey. Feel deeply honored to be a part of the team that drives Innovation for Life Sciences customers. a) How we were able to identify and define the nature of our organization and within that how we have been Innovating for our customers. As Eric Ries, the author of Lean Start Up states that entrepreneurial success can be 'engineered' by following the right 'process'; when imagining the same in Cognizant context, I feel thrilled to be a part of an organization that has a set framework/well-defined process for fostering an entrepreneurial spirit of the Cognizant Talent. Thanks Meghna for your kind words and wishes. Thanks for being a key contributor to the program from LS practice. Thanks for your kind words Magna. Without the enthusiasm of creative people like you, we wouldn’t have made this progress in Managed Innovation. Thank you for your contribution to MI at Life Sciences Practice. Changing the culture when your employee strength is growing from 60K to 135K in 4 years looks like an impossible task. However, the manner in which Cognizant's innovation leaders went about executing their program is really impressive. Kumar has done a fantastic job of presenting the journey backed by plenty of data. This story should inspire not just IT companies but any company! I wish the team all the best. Thanks for the kind words Vinay. Coming from an Innovation Expert like you, it means a lot to us. Thank You Vinay. Great to see your comment. Thank you for following our innovation journey and also your blog entry on Sukumar's Speech at IIMB, which is a great reference material for us. Fostering Innovation culture – Innovation management with change management was an interesting challenge. Conceptualization to inception and reaping the benefit of Managed Innovation process was a great journey. Cognizant Innovation group has constantly asked the question ‘what next?’ not because it has not worked, but because Cognizant’s associates are demanding more and constant encouragement from the Cognizant leadership team. The process, concepts and initiatives have sunk in well with the vast majority of the associates. Thanks Gokul for being one of the key contributors as a member of the innovation group. Hello Gokul! Glad to see your comments. Agree Conceptualization is easy. But making it happen and firing the imagination of 100s and 1000s of our associates across the globe is the real challenge. Thank you for your immense contribution being an early member of this wonderful Innovation Community. ‘Would n’t be great if we can harness the creative potential of every single employee of the organization?’ – With this vision from the executive leadership, innovation group started its journey way back in 2007/08. Since then, it has been a mixed journey of successes and few smart failures, but only filled with loads and loads of fun and insights :). We have relished every moment of learning in the team. ‘Could innovation be managed?’ – It is in quest of an answer to this question, that we had directed all our efforts into in these years with few basic beliefs and core values. And today, we shall confidently say that it is possible to manage innovation with disciplined process and motivated people. Yes, that has been the key for us. We call that as 'Top Down' and 'Bottoms Up' strategy at Cognizant. It has been a great privilege to be part of this wonderful team and wishes to the entire team as we are all set to take up new challenges in 2013 and beyond! As Kumar says, this is an excellent comment Vijay. Thanks for being a key contributor as a member of the innovation group. One of the brilliant comments on this forum Vijay. Agree. Fun and insights are the key in encouraging the smart failures. Thank you for being part of this great initiative. It feels privileged to be part of this journey and thank you for the mention in the article. I still remember the evangelizing days of the igniter sessions: At the BEGINNING of the Innovation IGNITER session, we posed the question: “Are you creative?” Only 4-8 out of 100 raised hands, uniformly across several sessions; in fact, of them, 4 or so raised only half-way ready to pull down if probed further (indicating the need for encouragement!) We posed the same question again at the END of the same session! Guess what? ALL 90-100 out of 100 raised hands confidently (that they too can innovate!) It was fulfilling to see the affirmative impact the igniter sessions were beginning to make. Of course, getting ideas to customer’s challenges was never a problem from then on! Fundamentally, it stemmed from the belief that every associate is an innovator and that ideas keep flowing in hallway / coffee break conversations / day-to-day work. I strongly believe that the managed innovation framework provides a platform by stimulating, nurturing, capturing, and inculcating flow of these ideas. This in turn helps us make business impact to customers! Thanks Vijay. As Kumar said, thanks for being one of the driving forces of this program. Without your early support and evangelization, we would not have come this far. Thanks Vijay. Agree, that’s a defining moment for the audience. Making each of our associates to realize they too are creative and innovative is the very foundation of Managed Innovation. Thanks to you for being a great partner driving MI in Technology Business Unit. Innovation and Creativity - automatically bring out the best in people. I have been extremely fortunate to be part of the Managed Innovation story at Cognizant from the start. As the article rightly states - It is employees with insights who ideate.Kudos to the teams and leaders who have nurtured the Innovative spirit in teams. I have been humbled and blown away by the avid participation by Manlog teams and leadership for all the MI events. I would like to commend the MI team who are very creative while conducting workshops , summits , journal and so on.That has been a great inspiration to many. This has been a great learning experience and I hope to continue to learn much more. Thanks Veena. Manlog has been at the forefront in the MI program from Day 1, thanks to champions like you. Without your contributions since the early days and still continuing, we would not have come thus far. Thank you Veena for your kind words and wishes. Well said, its employees with insights who ideate...Thanks for being a great supportor of Innovation and an and being part of this culture , enthusiastically experimenting new ideas that comes from the CIG. Its always a pleasure to be associated with you in our journey. Well said. Creativity is a magic word that inspires individual souls. Thanks for your kind words and for being with us throughout the journey. You are a great partner. Thanks Jay. This means a lot to us , coming from you as an ex-cognizant collegue and research scholar in business management. Thank Bhaskar for letting me know of this. Amazing (and also quite useful) chronicling of innovation at Cognizant. The authors need to be credited even more for choosing to preserve the history for posterity. Thank you Jay. As Bhaskar said, its a pleasure to receive those wonderful words from you. Profound and insightful story on Managed Innovation journey. Best wishes to the Cognizant Innovation Group! Thanks for your wishes Enfil. Proud to be associated with Cognizant! . The way Cognizant promotes innovation is something commentable. It makes beginners like me to look at things a different way, were the path that you choose become as important as the destination. Thanks for your kind words Anil. Exemplary work!! I would state it as "Innovation Ingrained in Cognizant". The organisation has sparked a nurturing culture inside every associate to Innovate. Innovation Team is a key to open the locked doors and see far beyond the existing world. To give an example, just as an 6 member internal team we implemented 47 ideas out of the 125 ideas generated of worth more than $1 million which was the tiny flash of light originated form Kiran & Vijay. In future I hope we would make the IT world to restate the term Innovation as Cognizant. Wishing the very best and feel very proud to stand with this organisation to make innovative histories!! Thank you for the wishes Mugil. Yes. Kiran and Vijay are great innovation mentors. Thanks for sharing us the journey of Managed Innovation. Happy to be associated with Cognizant & as well as an Idea champion. MI indeep is a powerful framework tool which empowered each and every associate in Cognizant. Thanks Rajalakshmi for your enthusiasm. Its because of idea champions like you, we have a thriving innovation community. Excellent to see how much we have achieved in the short span... well written story.. Happy to be part of the Innovation group.. Thanks to all the great leaders who are running this show and the Passionate associates for contributing to the ideas....Wishing all the very best for future and eager to see many successful stories and be a part of !! Thanks for your contribution and the wishes Ramesh Kannan. Thank You Deepak. Agree, the power of MI is in the ability to build nurture innovation community. Glad to be associated with you, your team and Academy Leadership. Academy is surely a great place with lot of energy enthusiasm, fun and your leaders are walking the talk. Thanks Deepak for your kind words and sharing your exprience in the MI journey. Its indeed a great experience partnering with a group like Academy who nurtures Innovation in a true spirit integrating Innovation part of their DNA. Looking forward for a great year taking Academy to the next level. All the very best ! Thanks for your contribution Deepak. Glad to be associated with you. Academy has a brilliant team and a great culture supporting new ideas. No wonder they have been forerunners of innovation within Corporate Functions. That's a wonderful journey behind Cognizant success. This incredible credit goes to the inspiring innovation group which showed the progressive stream by which Cognizant framed its unique brand in the market. Well Done & Looking for many more triumphs...!!! Being the Idea Champion for my account for last couple of years, I have personally felt that without the push and support from the top management,cognizant could have never achieved what it has done today -- "it created the Culture of Innovation among its associates". The ICBP training is now only the guidance for Idea Champions like us -- the culture of looking things from Innovative point of view has already been imbibed within its associates and turned them into enablers. Special thanks to Sukumar and team for guiding us to a new horizon!!! A handful of enablers creating a huge movement and impact in the organization is commendable. Great Journey! Thanks Yashodhara for being part of this incredible community. Thanks Yashodhara for the kind words. The credit goes to entire 50K strong innovation community. Thanks for being a key contributor as a member of the innovation group. Yes its very true that "Everyone is creative in their own way and every one of us is a potential innovator". And CIG has its own way of igniting it! Before participating in 24x2 App building contest organised by CIG, i never thought of myself as an innovator! I'm very glad and proud to be part of this successful Journey! Thanks so much Anand. To hear our vision shared by the associates (especially such yourself who has participated in one such event and who has felt the benefits) makes us really happy. We strongly believe that Build 24x2 (Hackathons) are definitely one of the best ways for building an open innovation culture at Cognizant. Please continue your participation in such events. Thanks CIG team. I am smitten by Innovation & enjoy my time as a Innovation Igniter treating minds which takes me to CAT fraternity/BU teams for live classroom/On-the-floor/Tandberg session(s). Literally going places. Sincere thanks & giving the scope of being my own in this space. My spirited participation in some of the future Igniter sessions is guaranteed. Innovation is all about positive energy & thanks CIG team for spreading & sustaining it on a ongoing basis. Thanks Ramesh. As Hari and Kumar have said, you have set a new benchmark for Innovation Igniters by conducting 100+ sessions. Kudos. Thanks to you Ramesh, with your passion and intent of igniting (and influencing the creative confidence) as many associates as possible at Cognizant. And single-handedly covering 100 sessions in a year is a feat in itself. It is people like you who make our vision of bottom-up transformation possible. Thanks for your contribution and being one of the STAR inginters Ramesh. Cognizant has a long history of innovation dating back to our founding. It is a part of our culture. It is embedded within our DNA. But harnessing that passion can be challenging. Sukumar and the Cognizant Innovation Group have done an admirable job encouraging the creative confidence of our associates and giving them an outlet for their passion and ideas. I am proud of the impact this team has had on Cognizant. Thank You for your executive support in nurturing the innovation culture Frank. We are surely delighted seeing your comment. Thank you Frank, for your kind words. It is highly motivating. Thanks for the kind words Frank. Coming from the CEO of the company, this comment means the world to us in the Innovation Group and to the entire Innovation Community at Cognizant. Thanks again. Thanks Arun for the kind words and your support. Thanks Kumar for walking us through past 4 years. This is a story of persistence, perseverance and consistence if efforts in putting together a framework to drive innovation. Thanks to Sudhir Burisetty and Vivek Vijay for including me in this initiative. It is an honor to be a part of the team. Thanks Monica for the kind words and for your key contributions to the program. Our special thanks to Sudhir and Vivek for including you in the initiative. Thank you Kumar for such a wonderful narration. 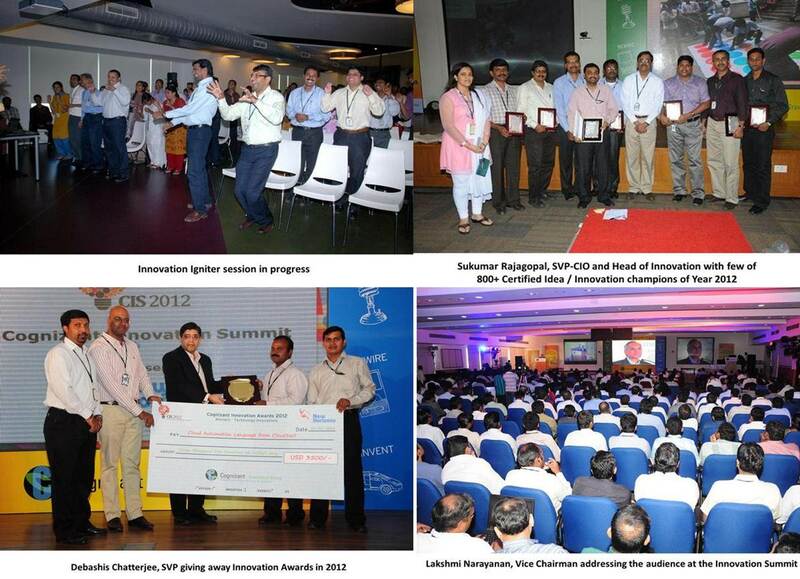 I consider it a privilege to be a part of the Cognizant Innovation Group and its success journey. The innovation initiative at Cognizant is a sign of foresight. Foresight that Cognizant has during times of change. Its an absolute delight to spread the word of innovation across the organization. Building an innovation culture and being an advocate of such an initiative gives me great joy. Thanks Prasnna. It’s wonderful to have passionate members being part of Innovation efforts. Thanks Prasanna for the kind words. Thanks for being a key contributor to the program as a member of the Innovation Group. Excellent and very crisp article on a very commendable journey! I am proud to have been part of this journey. The real icing on the cake for me is, when I see engineers at all levels celebrating on the floor when their ideas gets implemented in a product or results in revenue enhancement/Cost reduction/Customer Satisfaction index going up for the products/projects they work for! That speaks volumes about the success in inculcating the culture of innovation at every level!! Thanks for the kind words. We wouldn't have come thus far without major contributions from people like in the various BUs. Tech BU has been a key partner for us. Thanks a lot for your efforts. Well said Dani. When people at all levels can express their ideas and implement them without any fear however small, we are done. Kumar , very good story encompasses all important points. I had a feeling of reading our group story which you made more interesting and make us happy to be part of this team. I could say all these acheivements are possible because of our group leadership's empowerment. Thanks Geetha for your kind words. Thanks to you for being a key contributor to the program as a member of the Innovation Group. Excellent coverage on the Managed Innovation journey. Hearty Congratulations and Best wishes to the Cognizant Innovation Group! Thanks Balakumar for the kind words. The credit goes to you and the entire 50k strong Innovation Community not just the Innovation Group. Wonderful article. It has been an awesome journey with Managed Innovation! Thanks Philip for the kind words and your contributions to the program. Excellent coverage that would give a clear understanding of our Innovation Practice. Truly proud and lucky to be a part of this group that works under a great leadership. As an individual I have evolved in Innovation Journey and it has been a wonderful learning experience. Thanks Sumathi for the kind words. Thanks for being a key contributor as a member of the Innovation Group. It feels really proud to have been part of the MI journey (from the hosting side :)) and the kind of thought leadership and planned execution of MI is truly commendable. No wonder the apt title being is MI an oxymoron. Except for the certain minor aspects that will probably be too much for an article, reading the article is like attending an Innovation capability Building Program (ICBP). Really wonderful articulation of the gamut of things that we offer. Thanks a lot Hari for your contributions as a CIG member in the journey. Thanks Kumar for his crisp article. This is like the perfect recipe for systematic innovation in large organization. Having iterated over the years, this article (which could have easily been written as a book) has distilled the approach, challenges and best practices in a practitioner's approach. Very well done. Thanks for the kind words Kannan. We wouldn't have come thus far without major contributions from Innovation Champions like you. Congratulations and all the best for the finals.. Thanks for the kind words Snehal. Fantastic summary.Innovation culture in Cognizant has transformed and Inspired me.It really made an positive impact in me and resonates .Managed Innovation helped me to break the barriers and enabled me to reach new horizons. Thanks for the kind words Chandrasekar and thanks for being a key contributor to the program. Thanks Rammohan, Glad you liked the story. 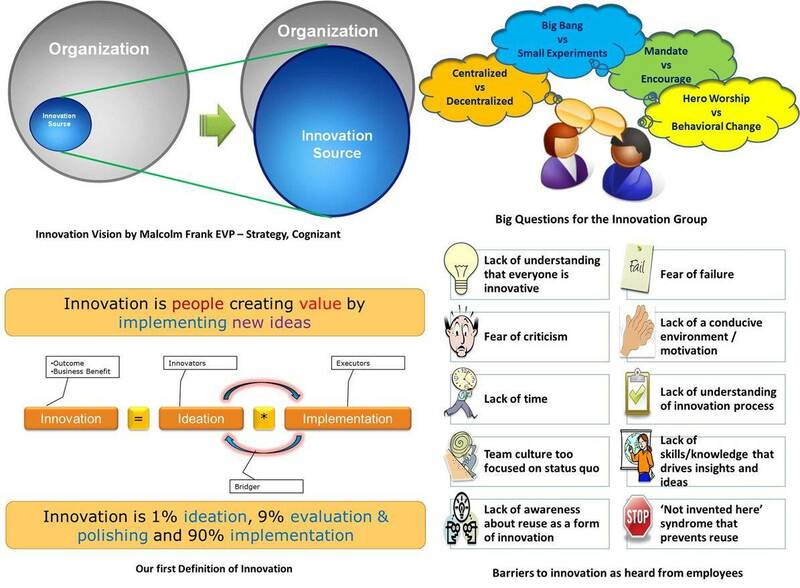 Thanks for the excellent post detailing the Innovation culture with in Cognizant. I am proud to be part of this as an Idea champion. Thanks Ram. Credits to all passionate idea champions like you. Thanks Ramachandran for your comment and for being a key contributor in our MI journey. Well narrated with metrics Kumar; looks as if you are walking us through a story. Thanks for acknowledging Tech BU’s effort in Managed Innovation. It has been a great journey with all of you @ Innovation Group. Great work by you & team in publishing such a wonderful post! Thanks Kiran for your comment. Without your and Tech BU's effort we wouldn't have thus far. We still have a long way to go and will look for your continued support. Another great and inspiring post from Kumar. All the very best ! Hope we @ Cognizant have a terrific 2013 ! Thanks Vijay for your kind words and wishes. We can have more awareness session by the Innovation team to the respective practices. (atleast once in a month) . They have to help people to eradicate the myth of " I am not eligible person for innovation ? I dont know how to come up with Ideas "
Thanks for your comment Jayakannan. I hope we didn't convey the impression that innovation is a done deal in Cognizant. We have a long way to go as we have now reached only 50K associates (we have 150K total). Collectively we have achieved something that we can all be proud about. We in the innovation group have the disposition of "Happily Dissatisfied" - happy with the progress we have made, while being dissatisfied with the progress we have not made. Thanks for your time. Thanks for your support Jayakannan. Your point shows that there are surely "Jobs Yet To Be Done" by the innovation group. As sukumar says we have long way to go. Thank You Sirisha and our in-house "Mind Mapping" Expert !!! I still remember our first conversation about this topic. Your contribution to the innovation community is invaluable. Thanks Sirisha for the comment and for being a key contributor. I wish all the best for Finals... I am pleasure to see entire Innovation journey at Cognizant! Thanks for the wishes Rajesh Babu. Thanks a lot Rajesh Babu for your kind words and wishes. It was quite an eventful journey that made a big impact in the Cognizant HR function by virtue of aggregating many of the small innovations - something like, many small fishes taking the shape of a big fish.. The best part of the journey was that it enabled our team to derive synergistic benefits from multiple innovations. Thanks for all the support Chandan. You have done wonders with your focus and drive. As Sukumar puts it, being synergistic is the best way to reap multiplying benefits. Thanks Kumar Chandan for writing about the HR team's journey. Synergy is the best part indeed. Well done. Thanks Umesh. Glad you liked the way it is written. Thanks for the kind words Umesh. Cognizant's innovation journey from begining has been brilliantly captured. To create a culture of innovation in a large organization in a systematic manner is something phenomenal and truly worth celebrating. Congratulations to each and everyone who are part of this journey. Thanks Sarada Prasana. You summed it up beautifully. It’s the collective effort that makes the surefire big impact. Thanks Sarada for the kind words. As you said, the congrats goes to the entire 50K+ innovation community across Cognizant. about it that makes a difference." I am proud to be a part of Cognizant's Managed Innovation team which helps the employees to give shape and struture to their wide spectrum of Ideas and convert them into innovations. Managed Innovation framework helps to tap the creativity, wisdom and knowledge within the employees and give a concrete form to it which can be used by the industry. Wow! What an apt Quote!!! Human brain is capable of coming up with 60+ thoughts each minute. How do you fire up people to do something about it? That’s the key and that key lies in improving their Creative Confidence. Thanks Bhavi for the nice quote from Nolan Bushnell. Thanks for being a key contributor as a member of the Innovation team. Been with Cognizant as an Idea Champion. Its wonderful to be associated with this group which simply in these years has put a strong thought in our brain "Innovation is part of our daily activities, its Kaizen. Its not always about thinking out of the box, most of the times its seeing things right through within the box. Its no rocket science and no idea can be termed stupid." Thanks to the innovation group, we have more YB,GB, Lean certified associates in each BU's. Glad to be part of Cognizant Family's Innovation culture. All the very best! Thanks Ghousiya for your kind words and for being a key contributor as an Idea Champion. you have captured the essence of the program very well, which is inspired by Kaizen and the Continuous Innovation philosophy. Thanks Ghousiya. I like your “Thinking Within” and “Thinking Outside” the box metaphors. It is wonderful to be associated with Innovation group as an Idea champion. Thanks to innovation leadership team ! thanks Sundaramurthy for your kind words and for your key contributions as an Idea Champion. Kudos. The article really helps a lot to get an clear idea about the strong Innovation culture in Cognizant. On the question “Is managed innovation an oxymoron?” my answer is simple “NO”. As managed innovation not only helps us to reduce the amount of re-work but also it can identify the Increment able ideas/processes much more efficiently based on future the global demand. Thanks for the kind words Biswaroop. you have captured very well, the essence of the Continuous Innovation process that we advocate as one of the key aspects of doing MI well. Very well written story that captures the Innovation journey at Cognizant so far. Proud to have been part of this journey. Thanks Senthil for your kind words and for being a key contributor. The Innovation journey at Cognizant has been nicely captured here. Great work team! Thanks for the kind words Tejas. Great work by Team Cognizant indeed. An awesome scripting of Cognizant's Innovation journey - Thanks for the detailed write-up. Am filled up with a feeling of pride to have been part of this organizational effort.Thanks for the oppurtunity & the learnings provided. Thanks Syed. Making all the ideators and innovators to feel proud. That’s the key to creative confidence too!!! Thanks Syed for the kind words and for being a key contributor. Cognizant's Innovation journey has been really well described in this story. Myself being an Idea champion am well aware of how Cognizant is focussed on making Innovation a success. The continuous efforts by the Innovation team in conjunction with the customer accounts in verticals and horizontals has taken Cognizant to new heights. The focussed training sessions and measuring of Innovation index at Verical, Account, Project level has really helped in inculcating the Innovation culture, which is extremely important to make Cognizant a truly innovative company. Thanks Kaushik for the kind words and for being a key contributor as an Idea Champion. You have captured very well, the essence of the collaboration that happens around Innovation across the organization. Thanks Kaushik for being an active member of the managed innovation community. Cognizant innovation drive is taking technology and business to an another level. Proude to be a part of such an innovative organizantion. Thanks for the kind words Tarun Deep. I am very happy being part of this innovation Journey in Cognizant. Motivating these many people, creating many numbers of ideator, finding out great innovators through collaborative approach is amazing. All the best! Thanks Sarav for your kind words. You said it, its truly the collaborative approach that made us reach out to every section of the Organization/ associates. We still have a long way to go...Thanks for being a great supporter of Innovation. Thanks Saravanan for the kind words and for being a part of the journey as a key contributor. Thanks Kumar for penning the evolution and insights of driving Managed Innovation at Cognizant, in such a captivating manner. I feel extremely lucky to be part of this high performing and self driven Innovation Group. The delight of working with the extremely passionate group of Innovation and Idea Champions is even more enthralling. The radiant look on the faces of participants after attending the workshops and events by the group, tells it all. They know that each workshop is a turnaround event and their tomorrows are going to be blissfully different. I have myself grown tremendously as a result of imparting and attending the numerous workshops and discussions. Every possible aspect of innovation is dissected and viewed from so many different perspectives aided by the learning imparted by experts ranging from film and music directors to neurosurgeons to mountaineers. Kudos to Cognizant and the Innovation Group !!!!!! Thanks Swati. We become what we preach. What we preach becomes our habit. I like your quote "have myself grown tremendously as a result of imparting and attending the numerous workshops and discussions"
Thanks for your contributions and we have a wonderful innovation team out here. Thanks for the nice comment Swati. Kudos to you for your key contributions as a member of the Innovation Group. Thanks for sharing the wonderful journey, Kumar. Thanks for the kind words Parthiban. I was an Idea Champion During this 2012Event ; The award given to me was inducing me to think more , research more and come up with new Innovative solutions.. In-Progress for 2013 !!! Thanks Loganathan. Congrats on your recent award for your contributions as an Idea Champion. Kudos. Glad to have been part of this amazing journey. I am sure we will reach new heights with the vision, effort and guidance of our innovation group. Thanks Jayaseelan for the kind words and for your key contributions to the program. Thanks for sharing this Kumar. 3. Mine is just a "small idea" and not really "innovation"
Wishing the Innovation Group and Cognizant a great year 2013 !! Thanks for the kind words Lakshminarasimhan. I think the credit for shattering those big myths goes to you as well as the entire 50K strong innovation community. I have seen Cognizant's Innovation grow from its infancy and proud to be one among the first set of innovation champions. It has spread it's wings amazingly rapidly across the organization and location both India and abroad. Great Job Kumar and team! Thanks Vimalan. In any big change initiative, it is the early birds that have the chance to make the biggest impact. Thanks a lot for being amongst our earliest Innovation Champions. Kudos. Thanks for the kind words Ciby. Admin Team and NSS team have done a tremendous job in the MI program and serve as the inspiration for the rest of us. Thanks Kumar for the great article capturing the innovation journey, feels great to have been part of this wonderful journey in Cognizant and as an Idea Champion. According to my experience, Managed Innovation is definitely not an oxymoron; rather it has transformed the total outlook of the associates in the way they look at their work. The survival in today’s world is tough and only way to servive is to develop innovative approaches to showcase our talents to the world. The managed innovation helped us to stimulate the innovative instinct in our “One DNA” and now it’s the “One passion” in our only “One Cognizant”. Thanks for the kind words Nilanjan. Thanks a lot for being a key contributor to the program as an Idea Champion. I feel proud to be part of this amazing journey with cognizant as an Idea Champion for my account. Early 2012, i felt Innovation is like a rocket science but after i went for an innovation workshop, I realized that there are continuous innovation which can be delivered on a day to day basis. The outcome of the workshop was to bring a TAB concept(Think,Act & Benefit) for my account and with the help of managed Innovation , We launched a campaign, make people and clients to participate in giving ideas , Shortlisted ideas and make them to a benefit to organizantion/client. If you wanted to be an Innovator – You don’t need to discover any new devices like Apple, “All you need to do is, Just Start Customize your world (Personal/Work) as much as possible to bring innovations which make yourself more comfortable and enjoyable”. I love Cognizant Innovation Summit(CIS) platform where we meet all the Innovators and Idea makers across cognizant and a very good experience. Proud to be with Cognizant !!! Thanks Vairamani for being a key contributor to Innovation as an active Idea Champion. You have understood it pretty well, its all in the mind, Innovation is not rocket science. Every small difference or tiny change counts. Very glad you enjoyed Innovation Summit (CIS) designed specially for the Innovation Community. Thanks for the kind words Vairamani. You have captured the essence of the program in your comment. Glad you liked the Summit. Thanks a lot for being a key contributor to the program as an Idea Champion. Innovation has been touching each and every associate in Cognizant in some way or the other. Thanks for the kind words Jeril. The Managed Innovation bandwagon at Cognizant has transformed us from passive onlookers to doubtful starters to passionate followers of the Innovation community. The culture of innovation is now deeply imbibed in every associate. Kudos to the entire team!!! Thanks for the kind words Vishnu. Thanks a lot for being a key contributor the program. Kumar - Your post is as enthralling as are your sessions/speeches. Managed Innovation is definitely not an oxymoron. I'd rather say that Cognizant's Managed Innovation model provides the perfect platform for associates to learn the innovation process, use the available tools and showcase their regular incremental innovations in their project. Managed innovation has brought a radical change in the associate's outlook towards innovation. Thanks for the kind words Sayantan. One Post and that captures solidly that Cognizant's strong commitment and belief that Innovation is the Oxygen for Survival. Great job in building this article. Being one of the Idea Champion, I'm proud of where Cognizant stands now with respect to Innovation and I look forward to days where people might look up to Cognizant for inspiration in future. The whole process of Managed Innovation is well planned, well explained. It made half of the job easier. The rest was all about involving all associates in the process. Once they were aware, we had "n" number of problem statements coming up and more importantly "n*n" number of ideas that could solve them. And that made a huge difference for us. As Kumar and Sukumar have said, Hats off to Cognizant Innovation Community for their remarkable effort and energy. Thanks for the kind words Manoj. Thanks a lot for being a key contributor to the program as an Idea Champion. Innovation Journey at cognizant captured brilliantly.WOW. Cognizant associates have imbibed the culture of Innovation into their day to day activities. So the results speak out. We can now proudly say that Innovation at cognizant has reached the maturity level. Thanks Kumar for the well documented article. Thanks for the kind words Lakshmanan. The Innovation journey at Cognizant has been well documented and at a detail level as well. Thanks for the kind words Ganesh. Thanks for the kind words Siva. Thanks a lot for being a key contributor in this journey. We could visualize the journey as we go through the writing!! Well captured without losing the essense of it. Thanks for the kind words Rajesh. Excellent articulation of our innovation journey!! Feeling proud to be part of it for our Corporate support function Administration and cherish the moments spent with innovation team to help us reaching our innovation index from 93% to 100% by taking the journey to each & every Cognizant office across the world and help Admin teams generate ideas and manage the innovation journey in their own way. Thanks Sanjeev for your kind words. Admin Team's implementation of the MI program is a true inspiration for all of us in the corporate function. Kudos to you and the rest of the Admin team. Well written article Kumar..Cognizant's innovation journey has been brilliantly captured. To me, innovation was always associated to companies like Apple & Google, but when it got kickstarted in Cognizant, it changed the overall realm of the organization..Total Turn Around!!!! Being an Idea champion at cognizant, it feels great to be a part of this journey.. Thanks Angir for your kind words. Thanks a lot for being a key contributor to the MI program as an Idea Champion. Very Well Written! The title of this post itself is capable enough to draw attention. Then, the article does justice to its title. Well done Kumar. Thanks for your kind words Soujannya. What a post, I can clearly see the Cognizant's Innovation journey through your post. Yes there is no doubt that Cognizant is the best place to deliver innovative solutions to our customers. Thanks Kumar for your detailed and informative post . Thanks Sudheer for your kind words and wishes. Managed Innovation has been a structured approach to inculcate/promote inquisitive behavior in the individual, a culture to challenge the status quo and belief system in the teams that there is nothing that cannot be done better. The effort that has gone behind is enormous and results are astounding. This is a true story of sweat & success. Thanks for the kind words. Thank you for being a key contributor to the MI program. This article is superbly scripted and makes me feel that i am really proud to be part of Cognizant Innovation Community!!!! Kudos to Kumar S and Cognizant Innovation Team !!!! Thanks for the kind words Dhanabal. The credit goes to the entire 50K+ strong innovation community at Cognizant not just the Innovation Group. Thanks Akila for your kind words and for your contributions to the MI program. Feels great to have been part of this amazing journey in Cognizant ! My answer to the question, based on my experience at Cognizant. Question: Is managed innovation an oxymoron? Answer: No. Firm 'No'. While serendipity, luck and in-born talents are welcome, they are not mandated requirements.Not long ago, it was thought by many that 'leadership' can not be taught or learned. Either you have it or not. Now, we know that leadership can be learnt, can be practised and we all can gradually learn to become good at it. Also, we know that many great leaders have some failures, some times. Till few decades ago it was widely believed that 'quality' is something undefinable; condensending words like 'you will know it - when you see it' were heard. Now, thanks to movements like quality circles and Kaizen, we know quality can be designed, built and delivered with accuracy measures like 99.9 etc.History shows us that , many things that were earlier thought to be ' not possible' have been turned around. Cognizant has turned around, in its own way, proving that innovation outcomes can be managed with a well thought out plan, supported by hard-work of execution. Cognizant leaders and employees have demonstrated that managed innovation is not an oxymoron. Excellent comment Bhaskar. Thanks a lot for your contributions as a member of the Innovation Group leadership team for bringing us thus far. Cognizant's innovation journey has been brilliantly captured. The story clearly highlights the steady increase in the awareness and impact to associates/customers. To create innovations using an individual or a small team's brilliance is one thing but to create a culture of innovation in a large organization in a systematic manner is something phenomenal and that is why its truly worth celebrating. Congratulations to everyone in the Innovation team. Thanks for the kind words Kartic. As i mentioned to Biswarup, the credit goes to the entire 50,000+ strong Innovation Community at Cognizant, not just the Innovation Group. Thanks Kumar for a wonderful story and congratulations for these great accomplishments. Proud to see our achievements which is still being difficult in many large firms to reap the benefits of bottom-up innovation. Thanks for the kind words Kadhar. A timely article! For those who were not part of the first years of Innovation at Cognizant and Industry in general, this puts everything in context. Thanks Krishna. Glad you liked the entry. Thanks Biswarup for the kind words. Credit goes to the entire 50,000+ strong Innovation Community at Cognizant, not just the Innovation Group. Thanks Arafath for your contributions to the MI program. Glad to heard that you learnt a lot. Extremely well captured and very nicely written, Kumar. It was almost as though i could see the years of events go past once again. It has been a great journey - and you have converted many from doubtful believers to staunch followers of the innovation impact. Thanks Jay for your support and kind words. Wonderful to see the progress and the impact made! Congratulations! Thanks for the wishes and your support Raj. Very proud to see this story make it to the finals. Good work Kumar. It is a proud moment for the entire Innovation Community at Cognizant. Thanks for the wishes and your support Sudhakar.